Go to original pattern for design DROPS 184-26. 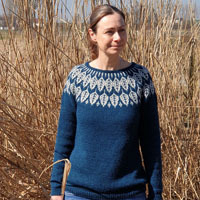 Set consists of: Jumper with round yoke and multi-coloured Norwegian pattern, worked top down. 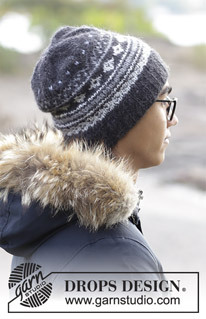 Hat with multi-coloured Norwegian pattern. 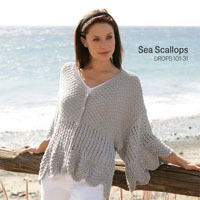 Size: S - XXXL Set is knitted in DROPS Air. For entire set use approx. 350-400-400-450-500-550 g colour 06 (black), and 50 g colour 03 (pearl grey), 04 (medium grey) and 10 (fog) – in DROPS Air. DROPS DOUBLE POINTED NEEDLES AND CIRCULAR NEEDLE (40 + 80 cm) SIZE 5 mm – or size needed to get 17 stitches and 22 rows in stocking stitch = width 10 cm and 10 cm vertically. DROPS DOUBLE POINTED NEEDLES AND CIRCULAR NEEDLE (40 + 80 cm) SIZE 4 mm for rib – or size needed to get 19 stitches and 25 rows in stocking stitch = width 10 cm and 10 cm vertically. DROPS DOUBLE POINTED NEEDLES AND CIRCULAR NEEDLE (40 cm) SIZE 4.5 mm – or size needed to get 18 stitches and 23 rows in stocking stitch = width 10 cm and 10 cm vertically. DROPS CIRCULAR NEEDLE (40 cm) SIZE 4 mm for rib – or size needed to get 19 stitches and 25 rows in stocking stitch = width 10 cm and 10 cm vertically. 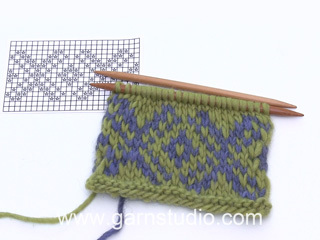 You can get the yarn to make this pattern from	46.00£. Read more. To calculate how to decrease evenly, use the total number of stitches on round (e.g. 96 stitches) and divide stitches by number of decreases/increases to be done (e.g. 12) = 8. 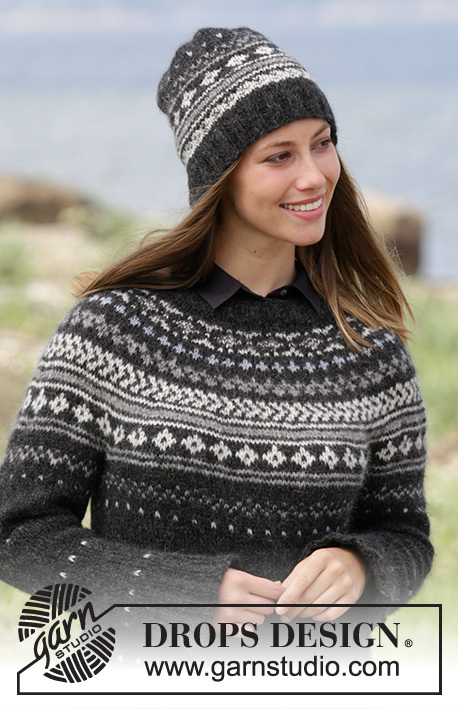 In this example knit approx. every 7th and 8th stitch together. When increasing make 1 yarn over after every approx. 8th stitch. On next round knit yarn over twisted to avoid holes. Jumper: See diagrams A.1 to A.3. Choose correct diagram for your size (applies to A.1). 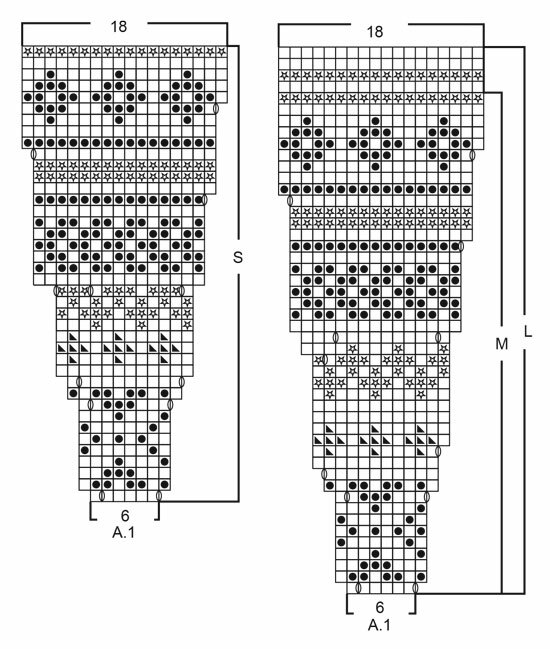 Work the entire pattern in stocking stitch. Begin from wrong side with black and purl until 7-8-8-9-9-10 stitches have been worked past marker thread at beginning of round, turn, tighten yarn and knit 14-16-16-18-18-20. Turn, tighten yarn and purl 21-24-24-27-27-30, turn, tighten yarn and knit 28-32-32-36-36-40. Turn, tighten yarn and purl 35-40-40-45-45-50, turn, tighten yarn and knit 42-48-48-54-54-60. Turn and purl back to beginning of round. Begin 3 stitches before marker and knit 2 together, knit 2 (marker is between these 2 stitches), slip 1 stitch knitwise, knit 1, pass slipped stitch over stitch worked (= 2 stitches decreased). Increase 1 stitch in every purl section as follows: Purl 2, pick up loop before next stitch and purl twisted to avoid holes. Slip 1 stitch knitwise, knit 1, pass slipped stitch over stitch worked. Worked in the round on circular needle, top down. Beginning of round is mid back. Work sleeves in the round on double pointed needles. Cast on 88-96-100-108-112-120 stitches on circular needle size 4 mm with Black. Knit 1 round. Then work rib = knit 2/purl 2. Continue rib like this. When rib measures 3 cm, knit 1 round while at the same time decreasing 10-12-10-12-10-12 stitches evenly - read DECREASE/INCREASE TIP = 78-84-90-96-102-108 stitches. Then work yoke as explained below. Switch to circular needle size 5 mm. Insert a marker thread at beginning of round. For better fit work an ELEVATION at the back of neck - see explanation above. When elevation is done, work next round as follows: Work A.1 in the round (choose diagram for your size) = 13-14-15-16-17-18 repetitions of 6 stitches)). Continue pattern like this and increase as shown in diagram. REMEMBER THE KNITTING TENSION! When A.1 has been worked, there are 234-252-270-304-323-342 stitches on round and piece measures approx. 21-23-25-27-29-31 cm measured mid back from cast-on edge. 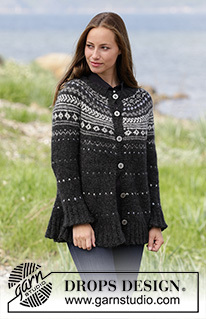 Knit 1 round with black while increasing 2-8-6-0-9-14 stitches evenly = 236-260-276-304-332-356 stitches. Work next row as follows from wrong side: Work as before with black over the first 35-38-40-44-49-53 stitches (= half back piece), slip the next 48-54-58-64-68-72 stitches on a stitch holder (= sleeve), cast on 6-6-8-8-10-12 new stitches (= in the side under sleeve), work as before over the next 70-76-80-88-98-106 stitches (= front piece), slip the next 48-54-58-64-68-72 stitches on a stitch holder (= sleeve), cast on 6-6-8-8-10-12 new stitches (= in the side under sleeve), work as before over the remaining 35-38-40-44-49-53 stitches (= half back piece). Finish body and sleeves separately. NOW MEASURE PIECE FROM HERE! = 152-164-176-192-216-236 stitches. Now work A.2 in the round on round (= 38-41-44-48-54-59 repetitions of 4 stitches). On round marked with arrow-1 in diagram decrease 4 stitches evenly = 148-160-172-188-212-232 stitches. When A.2 has been worked, work A.3 the same way. Repeat A.3 until finished measurements. AT THE SAME TIME on round marked with arrow-2 in diagram decrease 8 stitches evenly = 140-152-164-180-204-224 stitches. Then increase 6 stitches evenly on each of the rows marked with arrow-3, arrow-4, arrow-5 and arrow-6 – remember DECREASE/INCREASE TIP = 164-176-188-204-228-248 stitches. When piece measures 39 cm from division, purl 1 round with black while increasing 52-56-60-68-76-80 stitches evenly = 216-232-248-272-304-328 stitches. 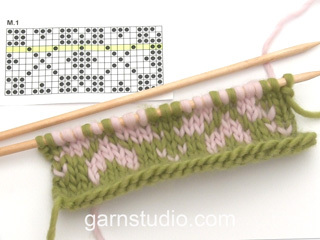 Switch to circular needle size 4 mm and work rib = knit 2/purl 2. When rib measures 4 cm, increase all purl 2 to purl 3 - read INCREASE TIP-1 = 270-290-310-340-380-410 stitches. When rib measures 8 cm (the entire jacket measures approx. 68-70-72-74-76-78 cm from shoulder), cast off with knit over knit and purl over purl. Work sleeve in the round on double pointed needles. Slip the 48-54-58-64-68-72 stitches from stitch holder back on double pointed needles size 5 mm and pick in addition up 1 new stitch in each of the 6-6-8-8-10-12 stitches mid under sleeve = 54-60-66-72-78-84 stitches on needle. Insert 1 marker thread at beginning of round = mid under sleeve. Move the marker thread upwards when working. Work A.2 in the round and decrease at the same time 2-0-2-0-2-0 stitches evenly on first round = 52-60-64-72-76-84 stitches on needle and 13-15-16-18-19-21 repetitions of 4 stitches). When A.2 has been worked, work A.3 in the round. 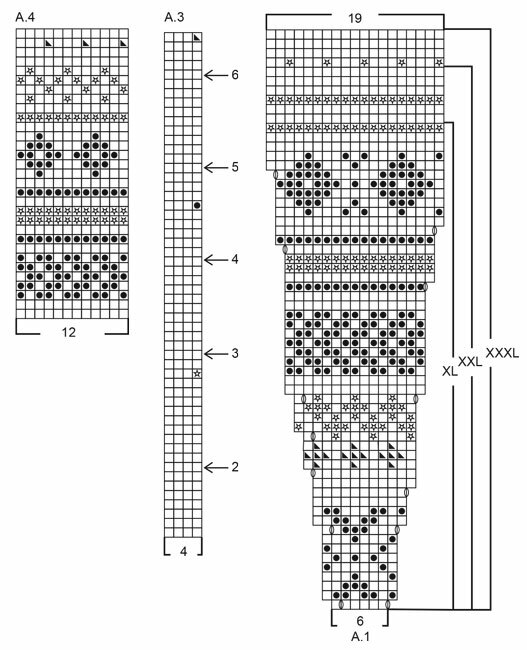 When A.3 has been worked 1 time vertically, work piece in stocking stitch with black until finished measurements. AT THE SAME TIME when sleeve measures 3 cm from division, decrease 2 stitches mid under sleeve - read DECREASE TIP-1. S: On every 10th round. M: On every 6th round. L: On every 5th round. XL: Alternately on every 3rd and 4th round. XXL: On every 3rd round. XXXL: Alternately on every 2nd and 3rd round. When all decrease are done, 38-38-40-40-42-44 stitches remain - NOTE: When decreasing, the pattern will not fit mid under sleeve, but make sure that the dots in A.3 are directly above each other on the rest of the sleeve). 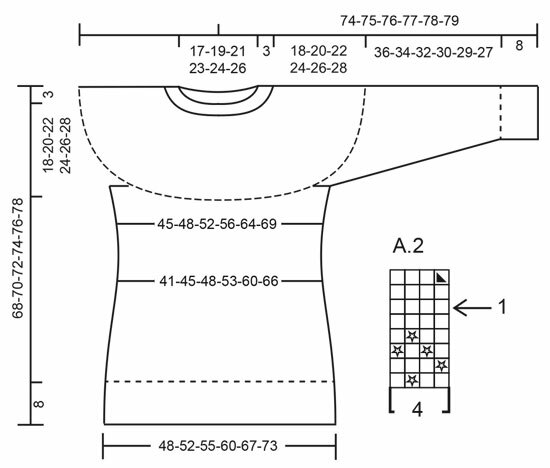 When piece measures 36-34-32-30-29-27 cm from marker thread (NOTE: Shorter measurements in the larger sizes because of longer yoke), knit 1 round while increasing 10-10-12-12-14-16 stitches evenly = 48-48-52-52-56-60 stitches. 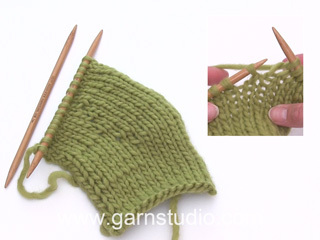 Switch to double pointed needles size 4 mm and work rib in the round = knit 2/purl 2 for 8 cm. On next round increase all purl 2 to purl 3 – remember INCREASE TIP-1 = 60-60-65-65-70-75 stitches (this is done to avoid a tight sleeve edge). Cast off stitches with knit over knit and purl over purl. Sleeve now measures approx. 44-42-40-38-37-35 cm from marker. Work another sleeve the same way. Worked in the round on a short circular needle, switch to double pointed needles when needed. Cast on 96 stitches on circular needle size 4 mm with black. 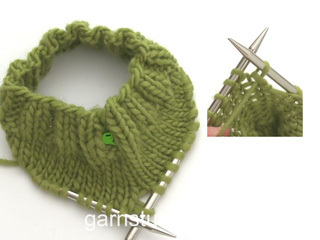 Work rib in the round = knit 2/purl 2 for 4 cm. Knit 1 round while decreasing 12 stitches evenly (knit every 7th and 8th stitch together) = 84 stitches. Switch to circular needle size 4.5 mm and A.4 in the round (= 7 repetitions of 12 stitches). REMEMBER THE KNITTING TENSION! When A.4 has been worked, piece measures approx. 17 cm. Continue in stocking stitch with black. When piece measures 19 cm, insert 6 marker threads in the piece, 14 stitches apart each marker thread. Continue with stocking stitch and decrease 1 stitch at every marker thread – Read DECREASE TIP-2 (= 6 stitches decreased). Decrease like this on every other round 3 times in total and then on every round 3 times in total = 48 stitches remain on needle. 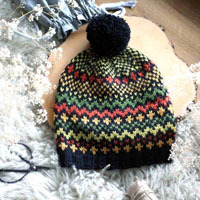 * On next round knit all stitches together 2 by 2, knit 1 round without decrease *, work from *-* one more time = 12 stitches. Cut the yarn and pull it through the remaining stitches, tighten together and fasten. Hat measures approx. 24 cm from top and down.